While the first-hand politicians of Afghanistan are encountering with each other on the basis of tribalism, flood and drought take victim from the people of Afghanistan. Based on figures released by some government media, the current drought is similar with the drought occurred in the last years of 40s. On that time too, the then government had no necessary capability to fight drought and asked donor countries to help it in the connection. During the rule of Taliban regime, Afghanistan faced with drought and rural people sold their goats and sheep to domestic markets against lower price. The current drought is more severe comparing drought occurred within the regime of Taliban. Climate changes caused over-flowing of water and floods in other places. In Panjshir the flood caused destroying of villages and rural economy. In his recent press conference, hinting on Panjshir flood and climate changes and responding to them by government institution president Ghani visited Panjshir province as well so that to inspect the suffering region from near. But, drought, flood and other evidences of climate changes are in need of comprehensive and strategic responding. Either drought or flood damage the rural economic foundations and compel suffering villagers to immigration. The suffering villagers pour in the cities. It is obvious that labor market in big cities such as Kabul, Mazar and Herat fall short of absorbing of immigrant villagers. Employment markets in big cities of Afghanistan are so weak that even those educated city youth are unemployed. When villagers come to cities and remain unemployed, it is obvious that they leave for neighboring nations and absorb in those countries’ labor market. Illegal emigration for these villagers create much problems. 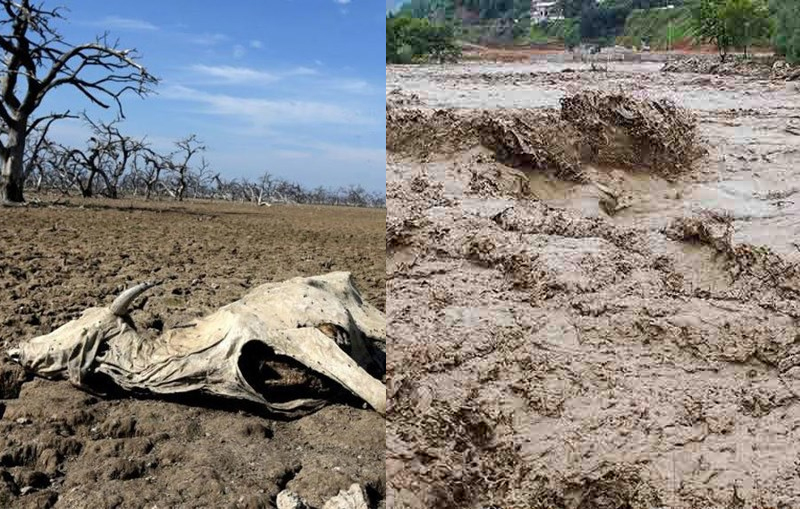 Focusing to such issues, the government should make an strategy for fighting with the impacts of droughts and floods so that the rural economy be rescued. Contributions of international community, relief institutions projects and government sectorial ministries should be organized in a manner to rescue the rural economy from annihilation and the damages of floods and drought to be minimized and the condition be ruled the villagers to leave their areas for a loaf of bread for the cities or neighboring countries the government even can earn the support of some neighboring countries. If these countries are concerning about pouring of illegal emigrants to their fiefdoms, it is better that instead of keeping aflame the war, they focus their attention towards economy of Afghanistan and support those projects that their aim is strengthening of rural economy. The rural economy links with the urban one. Annihilation of rural economy in a part of a province causes that all process of economy and commerce be suffered country-wide. The government should draft early programs based on reality so that to prevent collapse of rural economy. To fight against the impacts of drought, comprehensive programs also should be drafted and public opinion should know about them. What program the government has in its hand to fight drought impacts and how the government institutions implement them? The drought-affected people are awaiting for its response. The people are expecting from government to do what it promises.